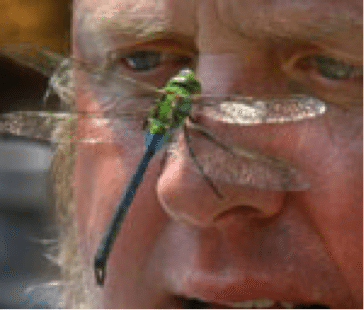 David Stokes, is an educator, naturalist, spouse, father, and humorist. He creates exciting learning situations through the use of songs, stories, movement, riddles, audio/visual and hands-on materials, actively engaging his audience. 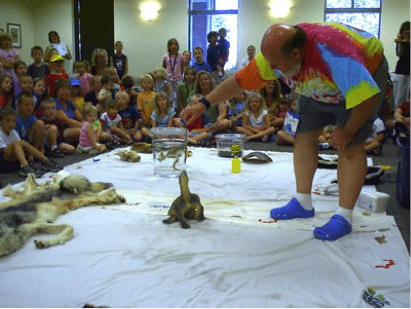 David brings along a trove of live animals and animal artifacts to his interactive program much to the delight and squeals of his attendees. Ferry Bluff Eagle Council invites you to join us in “Laughing with the Animals” with David Stokes, Friday, January 13, 2017 – 7 p.m. at the River Arts Center, 105 9th St, Prairie du Sac, WI (encore presentation Saturday, January 14 at 11 a.m.). His presentations for Bald Eagle Watching Days will focus on animals that live with eagles. David says, “to understand the great horned owl, interview the mouse. To understand the gray wolf, interview the white-tailed deer. To know the bald eagle, interview the fish.” David will have live fish, mice, turtles, frogs and a snake for the audience to see and touch. He’ll have animal pelts, and turtle shells to touch too! David uses humor, lots of laughter and sign language to connect with the audience. All events for Bald Eagle Watching Days are free and family friendly. Donations humbly accepted.